Make sure the kelp supplement you take passed our tests and is right for you! If you use a kelp supplement, it's important to choose carefully! Tests by ConsumerLab.com revealed that half of the kelp supplements it reviewed contained approximately 200% of their listed amounts of iodine, creating a safety concern. In addition, one of these was contaminated with the toxic heavy metal arsenic. Kelp supplements are primarily used as a source of iodine — an important mineral for healthy thyroid function. Most people get enough iodine through their diets, but those who are on a low salt diet or do not eat dairy or seafood, may be at risk for iodine deficiency. 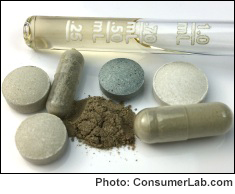 Fortunately, ConsumerLab also identified several high-quality kelp supplements which contained what they claimed without unacceptable contamination. One of these was chosen as CL's Top Pick among kelp supplements. You must be a ConsumerLab.com member to get the full test results along with ConsumerLab.com's recommendations and quality ratings of kelp supplements. You will get results for 8 supplements — 6 selected by ConsumerLab.com and two which passed the same testing through its voluntary Quality Certification Program, as well as information about one supplement similar to one that passed testing.